Yesterday, Nicalis finally revealed what The Binding of Isaac: Four Souls is all about – it’s an official Binding of Isaac card game for up to four players. Although it’s the first ever card game for Binding of Isaac, the Kickstarter campaign to fund the project is a huge success. It hit its initial funding goal in 1.5 hours and USD224,118 has been pledged. To back the campaign, visit the official Kickstarter website. Learn more about The Binding of Isaac: Four Souls below. Edmund McMillen today announced that the crowd-funded Kickstarter campaign for The Binding of Isaac: Four Souls has launched and is now open for backing. The all-new project from Edmund McMillen, the video game designer and creator of indie mega-hits Super Meat Boy and The Binding of Isaac, is a card game based on the themes and storylines presented in The Binding of Isaac series. 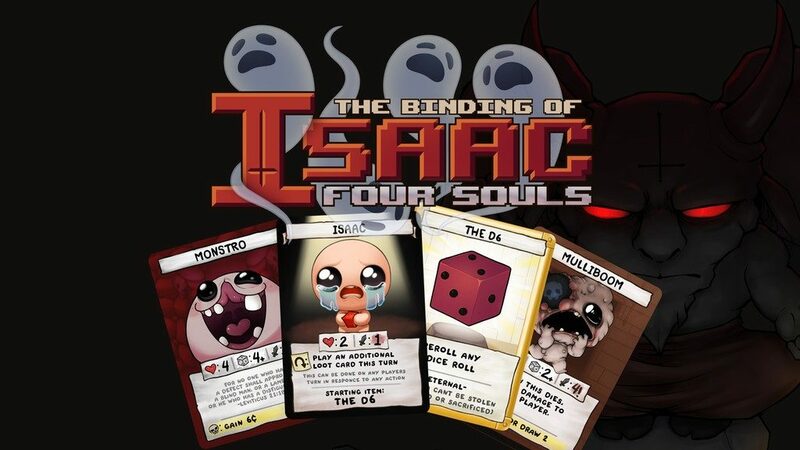 The Binding of Isaac: Four Souls will take elements of what fans experienced in the iconic video game series and drop it in physical form onto players’ card gaming location of choice. 2-4 players can randomly choose from four different playable characters, each with their own unique abilities that can affect the gameplay. Once started, players will have the opportunity to encounter an endless array of familiar monsters and items from the video game series as they decide whether to barter, play cooperatively or betray their opponents. In order to make this dream not a nightmare, a Kickstarter campaign has been created for The Binding of Isaac: Four Souls with a 30-day target goal of $50,000. If met, backers who provided monetary pledges will receive their tier of goods, which range from digital items to the base game plus expansion packs, collector’s editions, bonus swag items and more! With love and support and crowdsourcing help from fans, The Binding of Isaac: Four Souls card game will release in winter 2018. A working prototype for The Binding of Isaac: Four Souls has already been created and includes 100 Monster Cards, 100 Loot Cards, 100 Treasure Cards, 100 Pennies, 4 Character Cards, 4 Power Cards and 2 dice. Each game begins with players selecting a Character Card and receiving 3 Loot Cards and 3 Pennies. Players then take turns playing Loot Cards to attack monsters in order to gain resources that can be used to purchase items. Once strong enough, players can battle boss monsters that will yield souls. The first player to end their turn with four souls is crowned the winner.